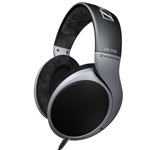 Sennheiser HD435 and HD555 are high-end home entertainment headphones. HD 435 open stereo headphones feature medium-sized dynamic, supra-aural headphones, powerful stereo sound, volume control, detachable, single-sided cable, 3.5 mm jack plug and ¼” (6.3 mm) screw-on jack adapter and comes with protective pouch. 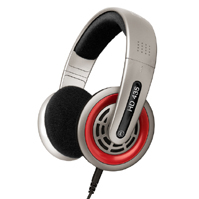 Sennheiser HD555 open back audiophile headphones feature ergonomic acoustic refinement (E.A.R. ), Duofol diaphragm technology that eliminates standing waves inside the capsule, highly optimized, field-strengthened neodymium ferrous magnet systems, lightweight aluminum voice coils, and well-balanced bass reproduction below the human audibility threshold (15Hz). GotFrag Hardware (dead link) also reviews Sennheiser HD555 and concludes with rating of 9 out of 10 that the HD555 is a no-frills, no-nonsense device that sells itself on its abilities. The only included device that’s really worth mentioning is the 1/4′” to 1/8” adapter, which would be a must-have for anyone doing PC gaming. Beyond that, the HD555 is simply what it is.